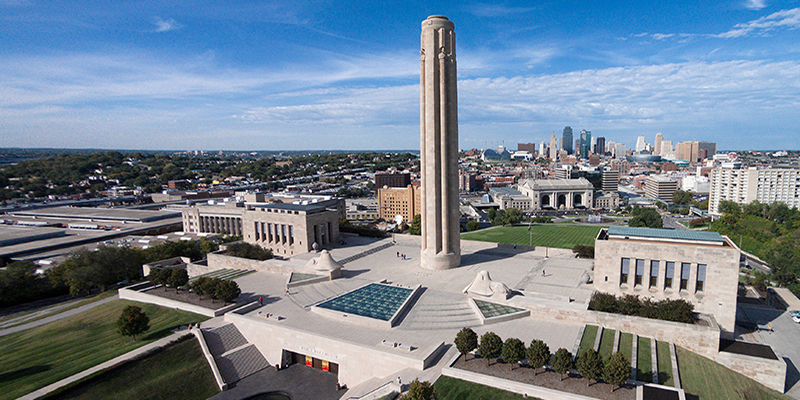 The Liberty Memorial, a towering presence in the Kansas City skyline, is perhaps the most visible of the City’s monuments, a solemn tribute to those who contributed gifts of great sacrifice. 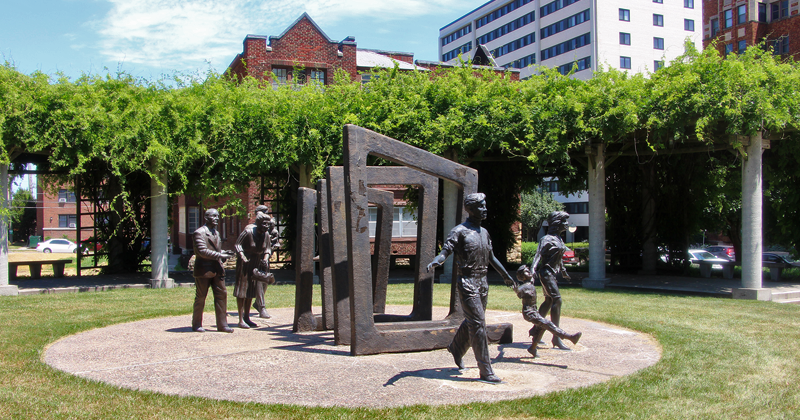 However, a drive through nearly any neighborhood or a walk through many of KC’s beautiful parks reveals a number of memorials that illustrate the stories and the service of so many. These are the bold words—a not-so-subtle command to future generations—inscribed in 1921 on the base of Liberty Memorial, the nation’s first monument to those who served in The Great War. Dedicated by President Calvin Coolidge in 1926, the tower honors the fallen while celebrating peace and victory. Memorials to those who would sacrifice in World War II were less than a generation away. Shortly before the completion of the Liberty Memorial, an equally impressive monument was dedicated to those from the Rosedale neighborhood in Kansas City, Kan., that served in the conflict. Drawing inspiration from the Arc de Triomphe, the Rosedale Arch was designed by neighborhood resident, John LeRoy Marshall. 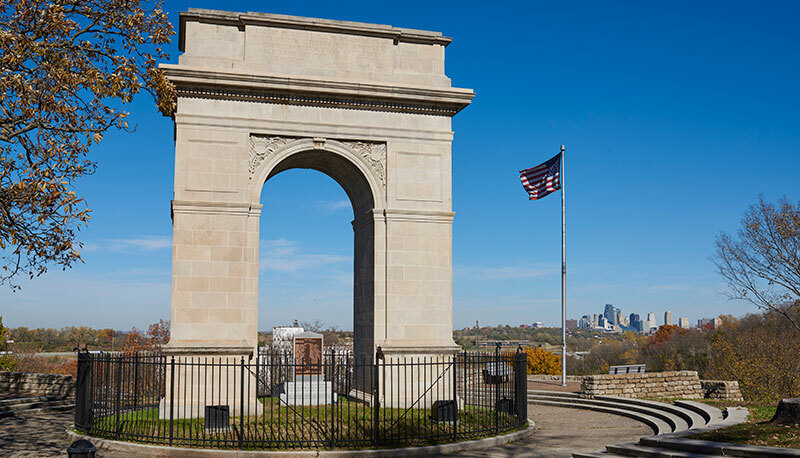 The monument is located just west of Westport in Mount Marty Park, offering a view of Downtown Kansas City that’s worth the drive to the top. 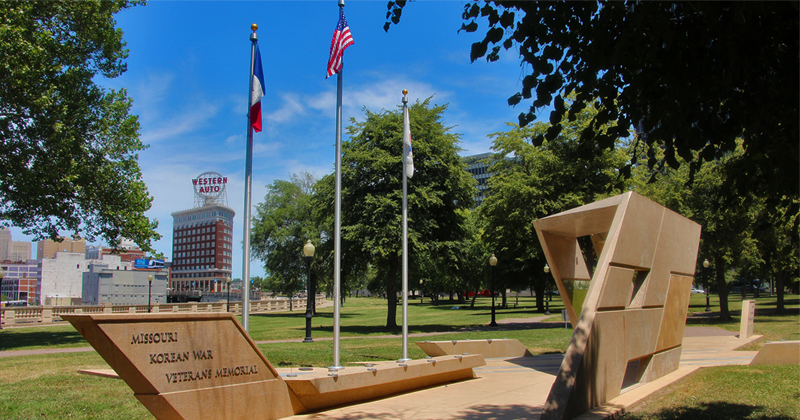 The Korean War, being so close on the heels of the Allied victory in World War II, has often been called “The Forgotten War.” But not in Kansas City. Just down the hill from the Liberty Memorial in Washington Square Park, the Missouri Korean War Veterans Memorial honors the 1.5 million Americans who served in the conflict, as well as the more than 900 Missourians—including 100 Kansas Citians—who lost their lives in Korea. Welcoming visitors to the Veterans of Foreign Wars National Headquarters in Midtown, the Citizen Soldier Statue marks a touching tribute to all branches of the military and all of the sacrifices made from the Spanish-American War to present day. 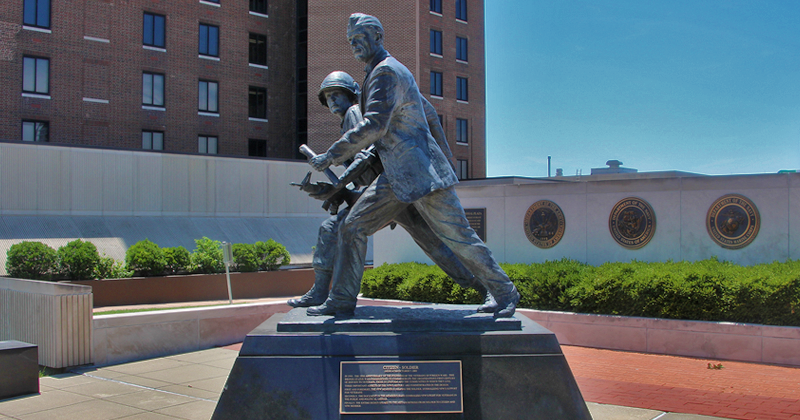 The statue, located in what is known as Centennial Plaza, is a reminder of the responsibility of both the VFW and regular citizens to support those who have served the country. 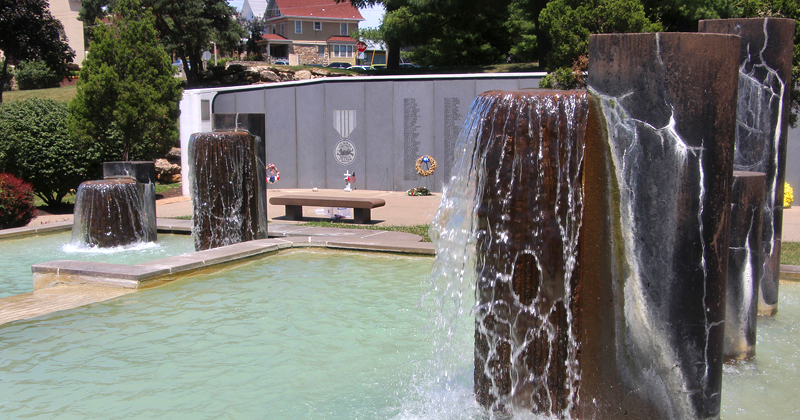 Incorporating Kansas City’s love of fountains, the Vietnam Veterans Memorial Fountain in Westport is split into two pools of water, representing the nation’s division over America’s tumultuous conflict in Southeast Asia. But the healing powers of water and the names of 451 Kansas Citians who died in Vietnam is designed to bring the City and the nation together in peace today. Over the years, Kansas City has lost more than 100 firefighters, all dedicated to keeping the community safe. 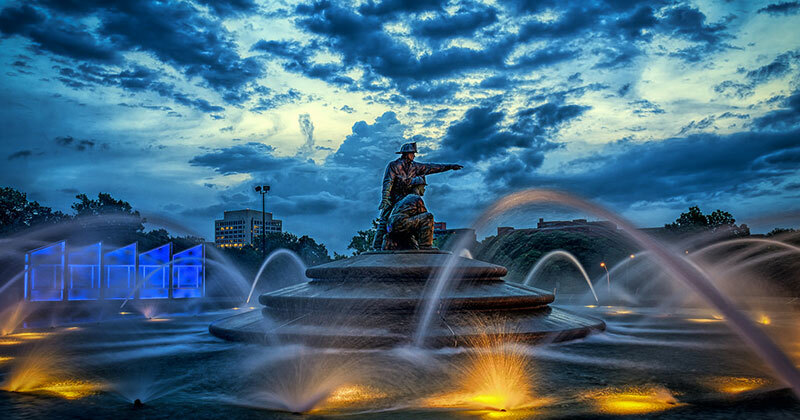 The Firefighters Fountain and Memorial, located just south of Union Station in Penn Valley Park, depicts two bronze firefighters surrounded by streams of water falling into an 80-foot wide basin. A stone wall behind the sculpture documents KC’s history and the names of the fallen, beginning in 1887. The Bloch Cancer Survivors Park on the Country Club Plaza celebrates those who have fought and survived a battle with cancer. Eight life-size statues depict individuals in the various stages of treatment and remission, serving as a reminder that death isn’t an inevitable fate for those fighting cancer. Meanwhile, the Positive Attitude Walkway—a meditative greenspace—is something all benefit from, no matter health or stage of life.